This is an in-depth review of the Nikon D610, a very minor update that replaced the existing Nikon D600. Since full-frame DSLR cameras typically have a 2-3 year life cycle before they are refreshed with newer models, the D610 was an unusual update, as it replaced a camera that was only 13 months old – something that typically only happens with entry-level/consumer DSLRs. The thing is, the Nikon D610 is what the D600 should have been when it was initially launched. Plagued by a shutter mechanism issue which shred small particles from the shutter that fell directly onto the camera sensor (causing “dust bunnies” visible at small apertures), the Nikon D600 got a lot of negative press from its owners and camera reviewers. We were among the first ones to report the dust issue in our Nikon D600 review and later received many reports from our readers that confirmed the same issue. In a couple of months, the Internet was full of all kinds of examples of the same issue. Nikon ended up issuing a service advisory that categorized the behavior as “natural accumulation of dust” and suggested to try using the “Clean Image Sensor” feature of the camera, along with manual cleaning with a blower bulb. As a last resort, if those two options failed, Nikon recommended to consult with service centers to get the camera examined and serviced. Unfortunately, despite all the reported issues, service orders and returns from unhappy customers, Nikon never acknowledged the problem. The Nikon D610 was announced on October 8, 2013. To make it seem like it was a real upgrade over the D600, Nikon threw in a couple of extra changes to the camera, such as faster frame rate, quiet continuous shooting mode and improved white balance. Nikon also lowered the MSRP price of the camera to $1999 from $2099 that the D600 initially sold for. This was done for two reasons – the Nikon D600 was already discounted by $100 for a while, and Nikon wanted to stay competitive with the Canon EOS 6D during the holiday shopping season. 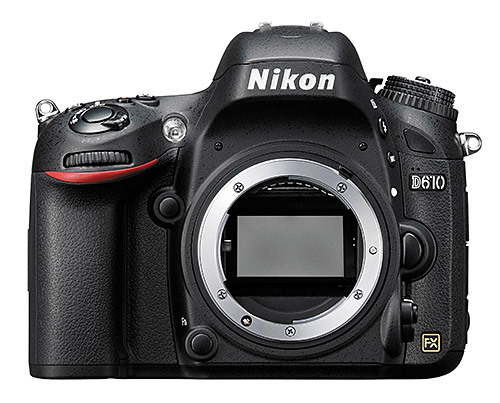 The Nikon D610 hit the store shelves very quickly – less than 2 weeks from the announcement date. I received a sample unit the day the camera became available and I have another one on its way for additional testing. My goal was to test at least two samples of the D610 to make sure that the dust issue is indeed fully addressed. Since the Nikon D610 is exactly the same camera as the D600 minus the new shutter mechanism and the minor changes mentioned above, I will simply re-post most of the information from my existing review of the Nikon D600. If you are here to read about my analysis of the shutter mechanism and if it addresses the dust problem, please go directly to the page 3 of this review. A New Shutter Mechanism – clearly, the issue on the Nikon D600 was the actual shutter mechanism that somehow shed particles on the sensor. Nikon completely replaced it with a different shutter, which not only addresses this dust issue, but also allows for a slightly faster frame rate (see next point). Faster Frame Rate of 6 FPS – the Nikon D600 had a 5.5 FPS continuous shooting speed and the D610 is now slightly faster at 6 FPS. New Improved Automatic White Balance – not that we had any complaints on the previous white balance performance of the D600, but for some reason Nikon decided to upgrade it as well. This one seems to be just a slight firmware improvement. Quiet Continuous Shooting Mode – this one is a new feature, designed to work at 3 FPS. Reading some of the marketing material from the D610, I first thought that Nikon also made modifications to weather sealing. After looking at both the D600 and the D610 side by side, I cannot identify any improvements in weather sealing. The construction of both cameras appears identical, with the same sealing and this includes battery and memory card compartments. The Nikon D610 shares exactly the same components as the original Nikon D600, including the 24.3 MP digital sensor. As you will see on the next pages of this review, with a native ISO range of 100-6400, the Nikon D610 provides pretty clean images throughout the ISO range for both daylight and low-light environments. Built to be affordable, it does not have the same robust autofocus system used on the D800 and D4 cameras, so it comes with an older 39 point AF system used on the Nikon D7000. Its shutter speed is limited to 1/4000th of a second and its flash sync is also limited to 1/200th of a second, which might be a disappointment for some photographers out there. However, it has 100% viewfinder coverage, 6 fps speed (which is faster than the D800’s 4 fps) and has the same 3.2″ LCD monitor with 921,000 pixels used on the latest Nikon DSLR models. And movie fans will be delighted to see impressive 1080p video with uncompressed HDMI output.